Our world may consist of the obvious three spatial dimensions that we can see and feel and move around in, but it may in principle have other dimensions of space that for one reason or another we cannot see and move around in, at least not easily. But principle is one thing, practice is another. Do we have any evidence in favor of or against extra dimensions, and if so, for dimensions of what sizes and types? If you’ve read about what extra dimensions of space are (see also here, here and here) and if you’ve understood why we expect Kaluza-Klein (KK) partner particles for any particles which can move in an extra dimension, you’re ready to understand what we know experimentally about extra dimensions. Fig. 1: A small boat moving on a ship canal can move both along and across the canal — two-dimensional motion. If it were a conscious creature, it would likely have developed senses that would allow it to produce a two-dimensional picture of the world. A second is that you, and everything that you and your scientific experiments are made of, can be tethered or trapped in some way so that, like a ship tethered to and towed along one side of a ship canal (Figure 3), you are insensitive to the presence of the extra dimension. Fig. 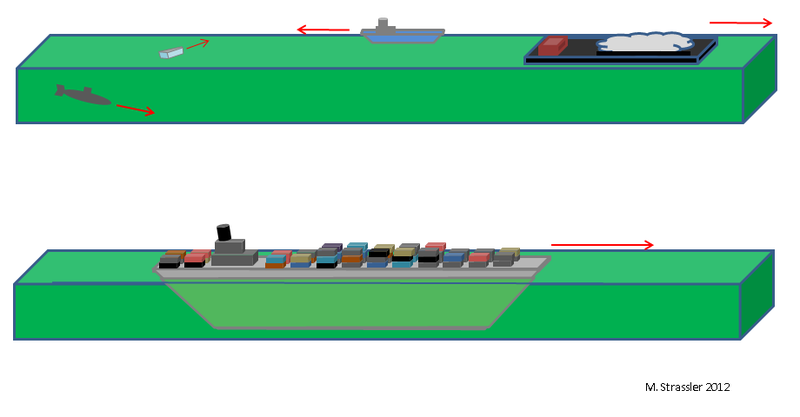 3: Bottom: Another boat, possibly longer than the canal is wide, but much narrower than the freighter of Figure 2, is tightly tethered to one wall of the canal and towed forward or backward along the canal. Like the freighter, this boat is similarly unable to move across the canal, though for a different reason. Top: This is to be contrasted with the small boat that can move freely across the canal. These ideas are not limited to a single extra dimension; there may be multiple extra dimensions, see Figure 4. Now, what can we do as scientists to rule out various possibilities? KK partner particles are very helpful, though we can make some progress using more intuitive arguments that I’ll give you first. How Big Could a Fully Accessible Extra Dimension Be? If all known particles were able to move in an extra dimension, then the atoms out of which we are made, and the light that we see, could move around in more than three dimensions. Clearly these dimensions can’t be infinite in size, or macroscopic in size, or we’d see them, literally; we could turn our heads in the direction of that extra dimension, just as we can turn our heads to the right or look down out our feet, and our eyes could absorb photons coming from that direction, just as they can see light coming from the horizon or from overhead. Since we don’t see them, any such extra dimensions have to be finite in extent and microscopic. Fig. 4: When we remember its finite depth, a ship canal really forms a finite three-dimensional world. Top to bottom, from left to right: Although a submarine can move throughout this three-dimensional world, a small boat can move across the canal but is “tethered” to its surface, so for it the depth of the canal is an extra dimension. The last three boats can move only along the canal: the boat tethered to the side of the canal, the barge, which spreads across the canal but is trapped at its surface, and the freighter, which completely fills the canal. These three boats all move one-dimensionally and their world naively appears one-dimensional; for them, the two finite dimensions of the canal are unexpected extras. In this case, the analogy of a two-dimensional strip or tube that appears one-dimensional from the point of view of something large — the example of a canal viewed by a large freighter was given in Figure 2 above — applies by analogy to us. The world might have four or five or eight or twelve space dimensions, for all we know, as long as all but the three dimensions we can see easily are finite and small in extent. We may just be too big to move around within them, just as a big freighter that completely fills a canal from side to side will be unable to move right or left. However, suppose that the extra dimensions that our atoms can move around in are significantly larger than the atoms themselves. Well, then we’d know that already, for many reasons. For one thing (for those of you who took freshman-year physics) all of the calculations of the heat capacity of gases presuppose that molecules in the gas are moving only in three spatial dimensions; if they could really move in more dimensions, the heat capacity calculations would disagree with data, by a lot. For another, all of our calculations of atomic physics — the energy levels of hydrogen, for instance — presuppose that electrons can move only in the three spatial dimensions that we can see. If there were more spatial dimensions, then electrons could move around in ways that we are not expecting them to, and that would completely change how they orbit within atoms, ruining our predictions. Since our predictions work very well indeed, we conclude that if there are any extra dimensions like the direction across a canal, the distance across those dimensions must be smaller than 1/10,000,000,000 meters (an “Angstrom”) or so. The same general logic applies to atomic nuclei. If there were extra dimensions as large as atomic nuclei (1/100,000,000,000,000 meters, a millionth of a billionth of a meter) then nuclear physics would be in many ways drastically altered compared to what we observe. These are just a few among many similar considerations. But we can go further. There’s a very powerful argument that gets us down another factor of about 100 or more. It relies on those KK partner particles, and it applies to a wider class of extra dimensions. in particle-antiparticle annihilation via a virtual photon. This is just the same type of process as electron + positron → muon + anti-muon. The only thing that is required for it to occur occasionally is that the collision of the electron and positron must have energy that is more than twice the mass of E times c2. So right away, this tells you that there are no KK partners of any electrically charged particle with mass below about 100 GeV/c2, which in turn means that electrons, muons, taus, up quarks, down quarks, strange quarks, charm quarks and bottom quarks cannot be moving in any extra dimensions whose extent is larger than about 1/100,000,000,000,000 meters (ten billionths of a billionth of a meter). Results from the Large Hadron Collider [LHC] (which has proton-proton collisions in which the process quark + anti-quark → E + E* may occur) have probably improved these limits by a small factor, of about 2 to about 10 depending on the type of particle. Now you might ask: wait, couldn’t the muon and the tau particle be KK partners of the electron, and the bottom and strange quarks be KK partners of the down quark? The answer is not obvious, but it turns out to be no. The way the weak nuclear force works on these particles assures that all of them get their masses from the Higgs field (or fields), and that none of them get masses directly from the effect of being KK partners of some other particle. [For instance, in electron-positron collisions, the muon and tau are produced with the same angular distribution, whereas KK partners of the electron would have a different angular distribution.] A couple of other reasons are given at the end of this article. giving a photon and nothing else detectable, can be used to look for neutrinos and for any other undetectable particles. No excess of collisions of this type were observed at LEP. Similar techniques can be used at the LHC, starting with a quark and anti-quark. In the end, limits on the sizes of extra dimensions for the known types of neutrinos are obtained, and they are not much different from the limits for charged particles. would be expected to occur, but none were observed. One might even have observed, in analogy to the “resonant” process electron + positron → Z particle, the process in which a single KK photon is created (and subsequently decays to a known particle and its anti-particle, such as a muon/anti-muon pair.) Nothing like this was observed at LEP; nor has anything like it been observed at the LHC. As before, this tells us that any extra dimensions accessible to photons are no larger than about ten billionths of a billionth of a meter. As for gluons, one may follow similar logic, just replacing the electron and positron at LEP with a quark and anti-quark at the LHC, and replacing the photons and their KK partners at LEP with gluons and their partners at the LHC. The absence of any surprises in the data (so far) puts similar constraints on extra dimensions for gluons. (where h is Planck’s constant and c is the speed of light) or something like this (depending on the shape of the extra dimensions.) If m is very small and L is very small, then M will be proportional to 1/L, but if m is large and L is large, M will be just slightly larger than m. For W, Z and top, with masses of 80, 91 and 173 GeV/c2, an extra dimension with a radius of 10 billionths of a billionth of a meter would produce a KK partner particle whose mass is not much higher than that of the W, Z or top itself. No such particles (which would be easy to detect) have been observed at LEP or the LHC, so yet again, the limits on extra dimensions are of the same size as for the other particles. To summarize: for all these particles, any extra dimensions in which they can move must be smaller than a few billionths of a billionth of a meter — something like ten million times shorter than the distance across an atom, and a hundred times shorter than the distance across a proton. In short, small. The search continues at the LHC for any sign of even smaller extra dimensions — by looking for the corresponding KK partner particles with masses in the range of a few hundred GeV/2 to a few TeV/c2. One looks for KK partners of electrons, muons and taus; of the six quarks, of the three neutrinos; of photons, gluons, W and Z particles — all and any of them. None have yet been found, so the constraints keep tightening on how big an extra dimension accessible to these particles can be. We left some loopholes: Higgs particles; dark matter; new types of neutrinos; and gravitons, the particles that are (as yet undetected, since they are extremely hard to produce) ripples in the gravitational field. Since knowledge about the Higgs particle is spotty at best, we can say rather little about it as yet. The one thing we can say is that a Standard Model Higgs (the simplest form of Higgs particle) has the same constraints on extra dimensions, roughly, as the W or Z, because it interacts very directly with them. The constraints could be loosened for a more unusual set of Higgs particles, but this is a long story, about which we’ll know more much more experimentally by the end of 2012. For dark matter particles, or any new type of neutrino, we can say even less. Nothing is known; these particles may not even exist, so there’s not a lot we can say about what their properties are. is certainly allowed, but the rate is very tiny. However, this is precisely where the story gets very interesting… because although, as we saw, extra dimensions accessible to any of the known particles must be 100 times or more smaller than the distance across a proton, extra dimensions inaccessible to all known particles but accessible to gravity could be quite a bit larger! This is a big subject that I’m going to address in a few steps. First, let’s see that we can already learn something from Newton’s law of gravity. Sorry in advance if this question is a not quite on topic. Complex numbers seemed to be used a lot in fundamental physics. Rather than living in 3 spatial dimensions and 1 of time, could we really be living in a space of 2 complex dimensions and not have noticed ? The degrees of freedom would seem to be the same in both cases. It is a nice question. The answer, non-obvious at first, is no. The point, essentially, is that this would force you to treat the three dimensions of space as inequivalent, choosing one to pair up with time and the other two to pair up together. This would constrain the laws of nature in ways that they are not, in fact, constrained. To understand this, start with a simpler problem: what is the difference between four real dimensions of space (with no dimension of time) and two complex dimensions of space? At first glance they are the same: (w,x,y,z) versus (u, v) where u = x + i y and v = z + i w. But the point is that there are rotations that are symmetric for four real dimensions that are not symmetries of two complex dimensions. you cannot leave y and z unchanged while rotating x into w. The only way you could do this is do a rotation that involves both u and u* and both v and v* — but that is illegal if you are treating these coordinates as complex numbers. More formally, the symmetries are the key issue. The symmetry group of two complex dimensions would be represented by unitary 2×2 matrices U(2), or U(1,1) [depending on how you do it] while the symmetry group of four real space dimensions is the orthogonal proper 4×4 matrices, SO(4), and for three real space dimensions and one real time dimension is SO(3,1). These lead to different constraints on physical laws. SO(3,1) is consistent with nature. Thanks. I’ve always wondered this after reading about the existance of spinors and the fact that SL(2,C) is a double cover of SO(3,1). I was thinking SL(2,C) might have been the symmetry group most consistent with nature. I think I will need to read up on defintions of symmetry groups again. When you include spinors (as you must, experimentally) you must indeed go to the double cover of SO(3,1). But that is not associated with organizing the coordinates of space-time as complex numbers. Rather, it has to do with the fact that distances in space and time are vectors (and not spinors) of the symmetry group, and are left invariant by some SL(2,C) transformations. In other words the symmetries of space-time itself are not sufficient to reveal the full set of symmetries that can act on the fields and particles that actually exist in nature. I guess in physics it is extremely easy to think of ideas like extra/complex/parallel dimensions but making them fit with what’s already known is incredible difficult. It seems invariant quantities, symmetries and laws of dynamics all play off one another. So I see that if I persisted with imagining we live in 2C, I would have to ditch distance as the invariant and use something else like area. But then even if I got SL(2,C) as the symmetry for dynamics, the corresponding effective theory in 3+1 would have lost distance as an invariant ( which is known to be true experimentally ). That’s a good way to say it. Data is enormously constraining; theorists can go off in all sorts of random tangents, but in the end it’s nature, via experiment, that brings us back to reality. Professor: I think I understand the rationale behind ‘compact’ extra dimensions. However, it seems what are referred to as ‘large’ extra dimensions are still pretty small/compact, i.e. atomic/subatomic scales. Can these extra dimensions instead be of similar spacial size/extent and ‘overlapping’ or ‘superimposed’ with the normal 3 (or 4) that we encounter? (For example, in your shipping canal example, what if the extent of the extra dimensions were of a similar size as the canal?) I assume that physicists have strong reasons for this not being the case. However, I haven’t seen a good rationale as to why the extra dimensions must not be very very large, far beyond the atomic level (i.e. as large as the universe) and coincident with the standard 3 spacial dimensions. Wouldn’t freedom of motion appear to be only in 3 spacial dimensions if the extra dimensions were superimposed entirely on each other? Perhaps you have addressed this above or before…apologies if so. Thanks! I am afraid I can’t yet answer your question, because you’re confused about dimensions in a way that makes it hard for me to know how to unconfuse you. What would it mean for extra dimensions to be coincident with the ones we know? Wouldn’t they then just be the ones we know? What would it mean to put north-south on top of east-west? Wouldn’t that mean that there’s just east-west and no north-south at all? Since moving east would also require me to move north, and moving south would require me to move west, wouldn’t that mean there’s really only one type of motion (forward or backward in a single dimension) and not two? Take a look at https://profmattstrassler.com/articles-and-posts/some-speculative-theoretical-ideas-for-the-lhc/extra-dimensions/extra-dimensions-how-to-think-about-them/worlds-of-2-spatial-dimensions/ , where I discuss various two-dimensional worlds. What would it mean, physically, to have a 2 dimensional world where the two dimensions overlap? How would you know things were two dimensional? Would you need two pieces of information to specify where you are, or just one? Notice none of my examples have this feature. That’s because there is (I would claim) no meaning to saying: this dimension lies on top of that dimension. That’s a way of saying they’re the same dimension, to start with. You should also look at https://profmattstrassler.com/articles-and-posts/some-speculative-theoretical-ideas-for-the-lhc/extra-dimensions/extra-dimensions-how-to-think-about-them/dimensions-of-physical-space/ to be very clear on what really makes a dimension a spatial dimension. Based on your answers to one or more of these questions I may be able to help you to a better understanding of what dimensions are and how they work, and then many of your own questions will have more obvious answers. Thanks for the article suggestions, I will review these again! In a partial answer to your questions above, I didn’t want to get too speculative in my initial question. But…the way I would distinguish one 3-D set versus another 3-D set – if they were overlapping and of a similar spatial size/extent – would be which forces/particles could act over each 3-D set. As a crude example, the EM forces/particles could act over a first 3-D set of dimensions, while the strong forces/particles could act over a second set of 3-D dimensions overlaid with the first. I don’t mean to propose any new crazy theories on reality here, I just was grasping for an explanation of why multiple overlapping 3-spaces cannot exist, given ‘some’ way to differentiate them from each other. I will review the links/article you mentioned more slowly a second time, and perhaps I will answer my own questions. Your answer doesn’t make sense as currently stated. Just take two dimensions that are overlapping: two infinite lines placed on top of each other. How many coordinates do you need in order to specify where you are? 1? or 2? (Strange, the ‘reply’ link didn’t appear for the thread portions below in my browser so I must respond at this level of the thread.) The ‘two infinite lines overlapping’ is a great example. My question basically asks if is it possible that these two overlapping lines (dimensions) can ‘share’ spatial coordinates, but each carry different forces. Only one spatial coordinate would be needed to specify a ‘location’ along the lines — i.e. point ‘X’ would specify the same point on both overlapping infinite lines. However, the two infinite lines would individually be associated with a different force. So, we would have two linear ‘dimensions’ with the same (or similar) spatial extent (each dimension represented by an individual line), and no compact dimensions. Force ‘A’ would act over linear dimension ‘1’ (line 1) and force ‘B’ would act over linear dimension ‘2’ (line 2), while both ‘dimensions’ would be superimposed and share a similar set of spatial coordinates. I’m feeling a little ‘out there’ at this point…thanks for being patient! Good — so physicists (and mathematicians) would say this is unambiguously an example of ONE spatial dimension, not two, because only one number is needed to specify your position. You’re simply using the word and concept of “dimension” incorrectly. So: what a physicist would do to turn your thinking into equations is that s/he would write that Force A should be determined by a field A(X), and Force B should be determined by a field B(X) — these are functions of X, just like your functions in grade school math, with a value for each X, and they can change with time. Each of these fields satisfies an equation that determines how strong the forces A and B will be, given the presence of some material objects that will exert those forces on one another. That’s exactly how gravity and electromagnetism work, for instance. You could imagine, perhaps, other ways of doing it; but BY DEFINITION, as long as there is only one coordinate X needed to specify where you are, there’s only one dimension involved. I’m not going to go into the details of how KK partners of SM particles have different charges, but it’s related to how Kaluza and Klein tried to get electromagnetism to emerge from five-dimensional gravity. Essentially, electric charge is equal to momentum in the compact direction, up to a shift. Very hard to get this to work in a realistic version of the Standard Model. Randall and Sundrum developed two related but different ideas involving warping and extra dimensions; the one appearing in your link is one in which (despite the impression given in the drawing) the extra dimension is very small. In the other case (not shown in the drawing) you can have a much larger extra dimension. But first, we need to look at the flat extra dimension case of Arkani-Hamed, Dimopoulos and Dvali. That’s much easier and is next on my list of things to do. Before spending time and effort to search for extraD it is logically sound to answer the question as of what function can a 1/100 of protom size extraD be ? What is the implications of what you said on the foundation of M-theory structure. It seems to me that you ignored one crucial point upon which many agree , that is ; any n-dimensions object cannot as a matter of physical fact enter into n+1-dimensions world……..a flat land creature cannot travel to the 3D world no matter how big the 3 dimensions are …….. SO ; large extra dimensions could in principle exist while all 3D objects are physically blind to all of them……. I think your mistake—- probably— is due to your assumption that extraD are identical to our spatial dimensions , an assumption based on mere speculation , extraD could in principle be impervious to 3D objects. As a proof of my claim just try to draw a figure of a 4D anything…….no one can , see what i mean ? our minds cannot in principle even imagine any higher dimensions ,so are our matter. A classic error in judgment. Your mind also cannot imagine quantum mechanics; but quantum mechanics is there in the data. The human mind is a far more limited thing than is nature — that is a key lesson of 20th century physics. Furthermore, mathematicians and physicists are very good at studying the properties of things they cannot visualize; so you are in serious danger of giving a proof that your own mind is more limited than those of your fellow-humans. Let us agree on one fundamental axiom that GOD creates for a function not in vain ( ALL of science is based on this ) , so IF higher , i mean higher not extra , dimensions exist ,there must be a function for their existence , consequently , i do not expect that any extra dimensions exist ……….i mean extra not higher. Aside from the fact that we shall not agree on such an axiom (because we shall neither agree that GOD is responsible for the world, nor that we understand GOD’s reasoning, nor that science is based on this) it is not obvious that extra dimensions are not crucial for our existence and survival. As scientists, we can only say that much remains empirically unknown and more experiments are needed. Had we followed your type of reasoning, many mistakes would have been made in the scientific past; there is no reason to think your type of reasoning will lead us down the correct path in future. Well , Then you are defending the fact free fantasy science where many thinkers agree that recent cosmology and particle physics are lost in the 10^500 landscapes of speculations……. are THIS what you call the correct path ?!!!! As for my previous comment where ” my mind is shown to be limited…….” i do not know who is the limited , those who delve in the unknown in principle with such fact free dreams/hal….. or those who insist that science should stay within the observable ?!!! My dear fellow-human ; Q.M. is related to our 3+1D world , but higher dimensions are outside the capacity of true science altogether so your comparison is misleading. In addition , what you call extra dimensions are in fact just extended ” femtohairs” of the 3D world , did you think of what would be the boundary/limiting membranes of those fingers ? N.B. : it seems that you adopt the ” we are the lords who knows every thing , you are the commons who knows nothing ” fallacy. Is it the correct path to deceive the public with fairy-tales of the extra/mega/meta/multi verse ?? Is it the correct path to spend billions upon billions of money units to fund few persons curiosity about some fantasies ? while ignoring human sufferingsssss ? Is it the correct path to lead people astray in the name of scientism/materialism/naturalism ? Is it the correct path to declare that GOD is not responsible for the world while the blind , lame , unconscious forces are ? declaring dogmas as ultimate facts ? For all who may concern : just study all posts of david coppedge website ( creation-evolution headlines ) to see how much is the correct path corruped. MOST of contemporary cosmology , particle physics and biology peoples are following the lead of lilliputian ” scientists” in their grand march in the corrupt path. Just study the ” first gene book ” by Dr. david abel to see how much of deception in science which claims the physical is directing the formal……a grand grand fallacy. With all my due respect. Is it the correct path to enthrone ignorance by proclaiming that the grand design of the cosmos was done by gravity or that the grand design of the living realm was designed by the blind watch maker !!!!!! If this is not deception , what deception is ???? If this is a correct path , what is the corrupt one ???? First of all, I would like to thank you for writing these nice articles about extra dimensions. I have a question: can any *known* particle be a “first-excited” KK state, and getting its mass PARTLY from the Higgs field, and PARTLY from the momentum in the extra dimension? Melectron= 300 KeV (from 1st excited KK mode) + 211KeV (from Higgs field) = 511 KeV. Mmuon = 300 KeV (from 1st excited KK mode) + 105.358 MeV (from Higgs field) = 105.658 MeV. Or is this possible instead (assuming another shorter dimension is involved, say 5 Mev for 1st excited state)? Mmuon = 5 MeV (from 1st excited KK mode of a different and shorter dimension) + 100.658 MeV (from Higgs field) = 105.658 MeV. Note that in these examples the electron and the muon are not strictly “partners”, i.e. successive excitation modes of the same dimension. Oops… I meant to quote only the first 7 lines, sorry. Rephrasing my over-complicated question, I would like to know if there is any chance that *any* of the *known* particles may contain *any* excited KK mode (i.e. I’m not requiring a full generation of particles that are KK partners). The only correct path of science is to declare mere facts , no arrogance , no prejudice , no human fallacies , no dogma , no hidden agenda , NO DECEPTION…….. The only correct path is to elevate and exalt human soul by showing how majestic , wonderful , miraculous the creation of the mighty GOD , this is the ultimate fact on which all of true, sincere , honest science MUST rest instead of its ugly corrupt path of leading most people straight to final perdition. So it was written , so it should be done period. Scientists are supposed to look for experimental evidences for their theories, in this case the extra dimensions. Prof. Strassler has also outlined the absence of evidence for extra dimensions at LHC and previous colliders. So I am not sure there is any overt ‘deception’ going on. Maybe the deception is the fact that each dimension has to be made of at least 3 main dimensions, who’s dimensions HAVE to be made of their own dimensions. This would correlate to an infinite amount of dimensions. I don’t believe the results. Most radical experimental and observational results turn out to be wrong; consider what happened with the faster-than-light neutrinos. The result you quote has not been confirmed, and it is likely just one of the many false positives that we see all the time. It would have been of huge importance had it been true, and the best experimentalists in the world would have been trying to confirm it over the past five years, and would surely have succeeded by now. Instead, the silence has been deafening. Yes, I was disappointed that no experimentalist followed up on this sensational claim. It was a very elaborate experimental set-up, and I read that it cost 1/2 million to conduct. So that might have discouraged other experimentalists, as well as the original Tajmar group, from repeating the experiment, with funding for science being tight. I was hoping to conduct a much simpler, far less costly, variant of their experiment that would also use niobium and liquid helium. My plan was simply to pass a high voltage discharge from a capacitor bank, through a piece of niobium, immersed in liquid helium, and see if any detectable acceleration signal shows up along the acceleration axis of the cooper-pairs. I have already done this with YBCO superconductors, with inconclusive results. The problem with hobbyist YBCO discs is they are all warped, so impossible to achieve a flat contact surface for the anodes. I’ve also tried accelerating the cooper pairs via a pulsed magnetic field, also with inconclusive results. Niobium has over 10 times the density of cooper pairs as YBCO, and being a metal is available in flat sheets, bars, and other shapes. If you know of any laboratory that would grant me permission, to immerse in liquid helium, a piece of niobium with anodes attached on either side to conduct such an experiment, I would be very appreciative. Liquid helium is far too difficult for an amateur to work with. I would cover the cost of liquid helium used in the experiment and all my travel expenses. And I’ve already built a portable, battery powered, high voltage discharge system, operated via a remote key lock system used for automobiles. I also built an accelerometer module, encased in a metal project box with amplifer stages. Since the experiment’s object is to achieve as high as possible a density of accelerated cooper pairs on an axis aligned with the sensor, I realize one problem is that the superconducting electrons are confined (to my knowledge) to a thin surface region of the superconductor, This would require careful alignment of the sensor. Any suggestions to improve the experimental set-up would be greatly appreciated. I don’t know. But I wouldn’t take this approach initially. The first thing you need to find out is why everyone who’s anyone distrusts the result. There may in fact be other existing measurements that rule it out, that neither those who did the study nor those who wrote the article were aware of. An excellent group that does many of the best gravity-related studies is that at the University of Washington. You might be able to get the attention of a postdoc or senior student in that group and ask him or her to explain to you what’s wrong with this measurement and why no one followed up. If you don’t get a satisfactory answer, then you can start thinking more seriously about doing the experiment for real. And I would get feedback from an expert on the design before you build it; there’s always the risk of a subtle effect giving you a false signal, and you don’t want to waste all that time and money only to discover the design was flawed. Thank you very much for the advice. I will definitely get in touch with someone at the University of Washington to ask their opinion on such an experiment, and whether it would make any sense to try it. I’m not sure if John G. Cramer is part of the gravity study group, but he has written many articles on gravity related experiments at his “Alternate View Column” http://www.npl.washington.edu/av/ He is a professor of physics at the University of Washington. I’m a retired engineering technician at the Woods Hole Oceanographic Institution, and am still a casual employee there. I’m used to working on electronic and mechanical projects, so this seemed right up my alley. But I would most definitely need guidance from professional physicists or post-docs, on the best way to set up and perform this experiment, as my understanding of quantum mechanics is somewhat limited. But first I’ll see if the hoped for results of such an experiment are not already ruled out by theory, or some other previously conducted experiment. Better make sure you’re following the quality science. Sorry to continue this somewhat off topic exchange, except in the sense that I speculate the acceleration signals observed at the Austrian Research Center might be connected to extra dimensions of space. I emailed one of the lead investigators yesterday at the Eot-Wash Group, enquiring if the experiment I would like to perform has already been done, or if theory rules out the results. Being it is the weekend I didn’t expect any response until Monday at the earliest. But I’ll keep you posted when I do recieve a response. Matt, thanks to both you and Glen Martin for the answers to my questions at the other blog. I just received an answer to my question about superconductor acceleration signals. Dr. Adelberger stated that his Eot-Wash group has not done any experiments to test the superconductor acceleration signal claims of Dr. Tajmar and his group, or similar experiments by Evgeny Podkletnov (who I also mentioned in the email). He also said that he looked carefully at the papers by the Austrian group and didn’t find them convinicing. So now I’m thinking if I can do this experiment on the cheap I might just go ahead and try it. It’s undoubtedbly a long shot, but performing the experiments will satisfy my own curiousity. Control tests will have to be part of the experiment, such as repeating the experiment, when the niobium rises above its critical temperature, all other conditions being identical. I also will need to make absolutely sure that any acceleration signal observed is not from some other source, such as an acoustic impulse. I can see I have my work cut out for me. I may know of a lab that uses liquid helium. In 2005 I was contracted to work as a technician by a former Woods Hole Oceanographic scientist. He is now a professor of Environmental Engineering at Columbia University. I did part of the work at the Lamont-Doherty Research facility in Palisades, NY. I believe the Chemistry group there uses liquid helium. There’s also the possibiliy that the Biology department at the Woods Hole Oceanographic Institute uses liquid helium. I am still a casual employee there, and used to fill my dewar with liquid nitrogen in that department, back in 2009 when I was conducting experiments with YBCO discs. Eek! My plan to do a science experiment on the cheap is running into reality. I just checked with a supplier of niobium and the minimum size piece they sell, suitable for the experiment, would be 150 dollars. That’s for a 1/4 inch rod 6 inches long. But I only need an inch or less. Not sure I could resell the remainder that I don’t use. Any suggestions about where to find a small piece of niobium are welcome. I’m sorry, but I think you can be wrong on this because you make an assumption that maybe it is not true. You assumed that the extra dimensions have the same properties as our commonly three dimensions. But what if not? What make me to consider about this possibility is the fact that we don’t have until now any evidence that our commonly three dimensions have any limitations about their size (or I am not aware about such limitations). If I remember right, our evidence are telling us that the Universe if flat with an margin of error less than 2%. If it will be proved that the space is perfectly flat doesn’t mean it is infinite in size, I know that. Anyway, what I am trying to tell is that if we don’t have limitations of the space size for the regular dimensions why to think they exist for extra dimensions? So, I asked myself what else it is characteristic for our space? And the answer is: the speed of light. How the Universe is influenced by the value of c? Because the value of c is the speed limit for any kind of interactions, its value determines in fact the speed of time passing. If I am not wrong, the value of c came from Maxwell equations and it is an attribute of the vacuum (is related to the electric constant ε0 and the magnetic constant μ0 by the equation c = 1/√ε0μ0). By the way, how the quantum mechanics theory generate the value for c (if it do that)? What if in this hypothetical extra dimensions an other value for c exist (because different ε0 and/or μ0 or by other causes)? Let say that the value of c’ (the speed of light in the extra dimensions) is 50 orders smaller than to value of our c, c’=c x 10-50. If so, we can say that the time flows 50 times slower than in our dimensions, so, if the Universe is about 4,3 x 10+17 seconds old from the normal dimensions perspective, it is only 10-33 seconds old from the extra dimensions perspective. With other words, maybe the Universe is in the extra dimensions in a state similar with what we believe existed before Inflationary epoch (before 10-36 seconds from the origin of Universe) when the space as we know today simple doesn’t existed yet. Maybe the extra dimensions Universe is small just because not enough time passed yet to became observable. Or, maybe we do not observe (using our senses or our instruments) the extra dimensions simply because for us nothing notable was happened yet there. For us it is a “frozen” Universe. If this is the case, we will never observe the KK partners for the regular particles because they do not exist. I don’t know if this hypothesis is falsifiable or what predictions can be made using it, this is far beyond my possibilities. I just wonder if there is any evidence that it is wrong. Sorry for my mistakes, I’m not a native English speaker. Some doctors will tell you not to exercise at all while taking it. It aromatizes (changes) to estrogen, a molecule proven to increase fat storage and decreases muscle mass. Thanks for sharing your thoughts on best green tea. Cerrajeros en Calaf Lo que podemos ofrecerle es Máxima Calidad y Garantía. The clarity for your put up is just great and i could suppose you are a professional in this subject. with approaching post. Thank you a million and please keep up the enjoyable work.